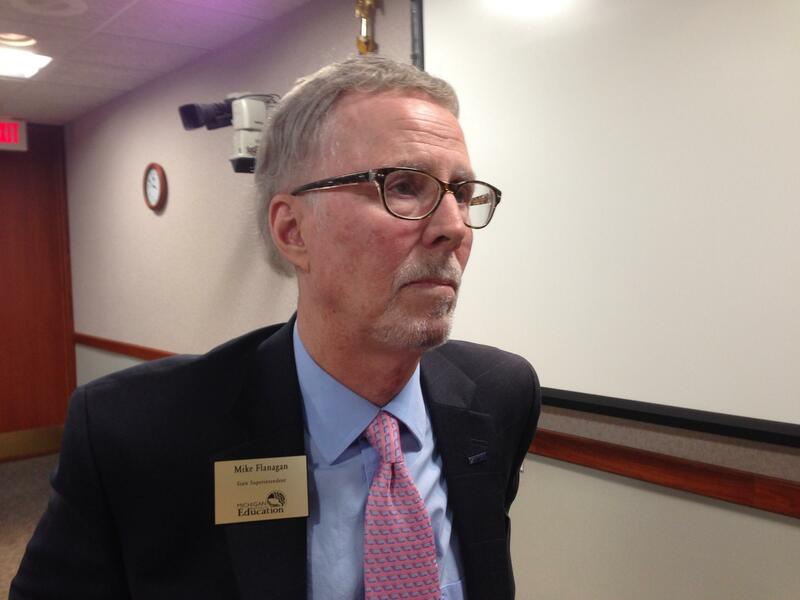 State Superintendent Mike Flanagan speaks with reporters during Tuesday’s State Board of Education meeting in Lansing. The state superintendent of schools is refusing to weigh in on the debate over school funding ahead of the November election. That issue has been a central talking point in the governor's race. Gov. Rick Snyder says he has increased education funding every year he has been in office. He includes money that went to shore up teacher pension funds. Democratic nominee Mark Schauer says Snyder has cut funding by about $1 billion. State Superintendent Mike Flanagan says he is not interested in getting involved in the debate this close to the election. "I'm not going to, a month before, get into that," Flanagan told reporters at Tuesday's State Board of Education meeting. In June, Flanagan credited increased state funding for helping reduce the number of districts with budget deficits. But he has also urged Gov. Snyder and the Republican-led Legislature to spend more on public education. During the State Board of Education meeting, Flanagan cautioned schools against punishing teachers based on state standardized tests. That's at least until the state settles on a new exam. State lawmakers this year blocked the implementation of a computer-based test to replace the MEAP exam. That means students will likely take three different standardized tests in three years. "We had the old MEAP last year, we have the new MEAP this year because of the Legislature's action, and then we're going to have a different test the following year," said Flanagan. "So, to have three different tests isn't really a way to fairly anticipate what student achievement growth is for each teacher." Current state law requires schools to evaluate teachers based on student growth. Flanagan is urging districts to use local tests to measure student growth until a new statewide exam is chosen and fully implemented. Flanagan says he is not interested in giving "lame duck advice" to state lawmakers, who are expected to take up major legislation after the election and before the end of the year during their "lame duck" session. He indicated that he is not a fan of an outgoing Legislature passing controversial bills after an election, saying they should be accountable to their constituents for those votes. But the state superintendent did urge passage of one bill. Flanagan is asking state lawmakers to give him authority to help address teacher shortages. An old law allowed the state superintendent to identify subject areas that did not have enough certified teachers. Affected districts could temporarily hire uncertified or retired teachers to fill those holes. But the Legislature allowed that law to expire in July. Flanagan says that is already creating problems. "It's kind of like the situation that got reported in Detroit a couple weeks ago; 100 teachers short," he said, citing a Detroit Free Press article published last month. "So, we don't have teachers in the classroom at all." A state Senate panel approved a bill in May to restore that power to the state superintendent. Senate Bill 907 has since stalled on the Senate floor.